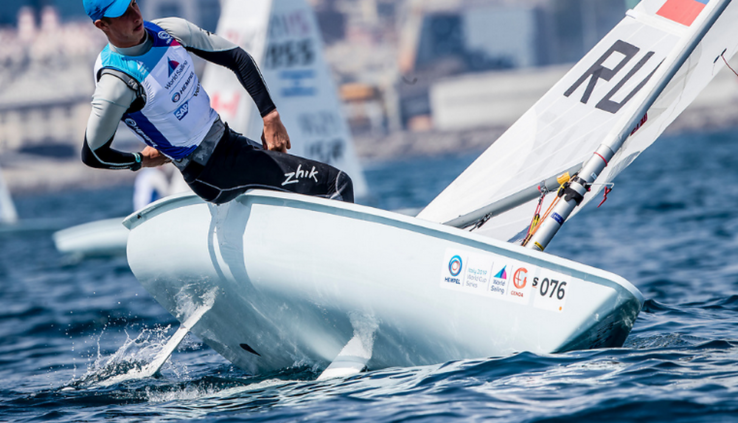 As we already reported, in Genoa (Italy) began the third stage of the world Cup 2019 in the Olympic classes. However, started from scratch. In accordance with the schedule on Monday to start out only yacht class 49er, 49erFX and Nacra 17. The remaining 5 classes (in Genoa, recall, are not windsurfers) was to start a fight on Tuesday, but failed the wind. Only 3 – 5 knots, so one race was able to hold in the “Laser”, and in one of the three 49erFX fleets. 470 (men). From Russia claimed Paul Sozykin and Denis Gribanov. The race kicked off. 49er . (65 teams). 57. Held 2 races. …57. Konstantin Nosov/ Alexander Gaydaenko (wards 28 – 27). …60. Jan Cech/ Ivan Zotov (wards 31 – 26). 49erFX. (49 teams). Held 2 races. …41. Zoya Novikova/ Diana Sabirova (wards 20 – 18). Nacra 17. (40 crews). 1 held a race. …13. Maxim Semenov/ Alina schetinkin (7th ward). …25. Sergey Dzhienbaev/ Sofia Kiselyova (13th ward). Laser. (109 participants). 1 held a race. …3. Sergey Komissarov (2nd ward). …7. Daniil Krutskikh (4th ward). …53. Cyril Evfimievski (27th ward).